Building blocks. Cars and trucks. Shape sorters and puzzles. These toys have stood the test of time – captivating children as effectively today as they have for decades. Automoblox has taken valuable elements from each of these classic toys to create a fresh line of modular wooden vehicles that allows children to create their own car styles. Automoblox has merged the fun factor of classic car toys with the warmth of natural wood, richly colored roofs and bright rubber tires to create a design system that stimulates creative thinking and excites the tactile and visual senses of children at any age. And by combining the open-ended play of wooden blocks with the cognitive challenges of shape sorters and puzzles, Automoblox has created a play system loaded with the healthy developmental benefits that are so necessary for today’s kids. American designer Patrick Calello came up with the idea for Automoblox while studying industrial design at Carnegie Mellon University. A combination of his passions for design and automobiles, Calello’s vision for Automoblox is to create a toy that inspires the next generation of great thinkers and creators. With a design portfolio that ranges from consumer products to high-end electronics to Broadway marques and Columbia Records platinum albums, holding dozens of US and International patents, Calello infused Automoblox with resources to help children develop their own unique sense of style and design confidence. Every Automoblox car is marked “Designed by Calello” as a testament to the pride that went into creating one of the most innovative toys of this generation. Every child is an individual with a unique sense of creativity and style. The creation of something new and unique – born of a child’s imagination – is the idea behind Automoblox. There are plenty of building and assembly toys on the market that include instructions and illustrations to help children build the product that is pictured on the box. With Automoblox, kids play “outside the box” – assembling the unique designs pictured in their own mind’s eye. By playing with the Automoblox, a child can discover how they perceive shapes and part-towhole relationships by putting the puzzle pieces together. They will begin to use skills such as rotation, integration and see angles to accurately differentiate between shapes and and how they can build and design their own cars. Creative problem solving skills develop as your child is able to formulate new ideas and produce a variety of responses (or different combinations to create new car designs). Automoblox helps in developing planning skills. Creativity involves originality, flexibility, independence and playfulness. Gross and Fine Motor Skills develops and exercises a child’s sensory and motor modalities. Automoblox promotes the development of the ability to coordinate precise hand and visual movements, precise movements of the arms, hands and fingers and the ability to develop finger dexterity and speed of motor movements. With multible levels of play, Automoblox grows with your child. At first, a child may mostly puch around an Automoblox car. Feedback from the real rubber tires makes that play experience quite satisfying. The stylish people, with a built in shape sorter, will challange their curious minds. Encourage the child to pull off the wheels and tug on the roof. As the child develops and becomes more faimiliar with Automoblox, the bulk of their play will focus on assembly and disassembly. Once challanging physical tasks will become second nature. This play pattern is in addition to simply pushing and playing. As the child masters the basic skills to assemble cars their attention will turn to create their own designs. Tangible cars and a great sense of accomplishment will result from a stimulating and rewarding creative process. Automoblox cars are cool and stylish, never to be considered a „baby“ toy. The durablity, design and uniqueness of Automoblox lends itself to proud display on a young man’s dresser long after the useful playlife is up. Automoblox sought to create a toy that would excite a child’s soul, creating fond memories of a awarding childhood. The many thoughtful details of the Automoblox construction system lead to suprisingly long play times for pre-school aged children. From the interchangeable tires, wheels, roofs and body blocks, to the form board inside the car that is created by the geometric feet the people have. Automoblox gives a child the opportunity to be a car designer. Automoblox really wanted to get children thinking about creating vehicles born out of their imagination at a young age. Automoblox engineered just the right fit of patented connector system. A wonderful „thunk“ accompanies the snapping of blocks together. A delightful „snap“ occurs when you click a connector in place. The details are ment to give the child necessary feedback as he or she sets out to accomplish the task of creating a unique car. The way the real rubber tires grip a hardwood floor. The beuatiful shapes, vibrant colours and sophisticated styling is engaging to all people of all ages around the world. Cars truck are typically considered „boy toy“ but you will find the soft shapes and gentle curves and engaging play experience equally engaging to girl. Automoblox even encourages parent child interaction as well as interaction with and older sibling. Creating something new and unique is an exciting experience. The Automoblox play system brings this excitment to each child that encounters Automoblox products. With millions of combinations, the variety of solutions this dynamically, ever-changing toy provides an excellent framework for creativity. The character and durability of classic wooden car toys – fused with an edgy modern design – is transformed into a building block design system that allows kids to create their own car styles. Automoblox brings old-school play values into the 21st century. We live in a world where toys are a disposable commodity. The founders of Automoblox believe however, that we may be giving our children a harmful message. Automoblox feels that it’s better to have one great toy instead of 10 cheap ones. It is this thinking that enabled to engineer Automoblox at last. The selection of materials that comprise all Automoblox cars were made to meet specific performance requirements rahther than a mass-market price point. Designed to heirloom toy from the get-go, Automoblox anticipates the bond between the child and the toy to be so great that they would wish to save Automoblox and pass it on to their own child. 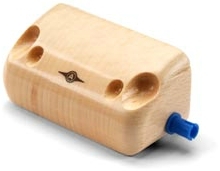 Rich, renewable resource, European beech wood bodies and the eye-catching colors of premium polycarbonate plastics combine to create a toy durable enough to withstand generations of play without losing its visual and tactile charm. Automoblox are the highest quality objets d’art, built for the rough and tumble play of adventurous young designers. Each Automoblox wheel is molded out of polycarbonate plastic which makes it literally bullet-proof, nearly impossible to break. It is finished in silver metallic paint with a non-toxic, clear coat finish for a lasting shine. The beautiful translucent roofs featured on every Automobloc car are molded from polycarbonate plastic. The finish is equally rich with colour and translucent. 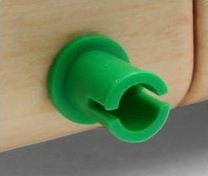 Simple drops are common in toys, but Automoblox is engineered to survive any accident involving an impact on its roof. Automoblox was designed to withstand 10 repeated drops with all the weight being transferred on one wheel from a height of 2.1m. The car survives the test with little or no damage. 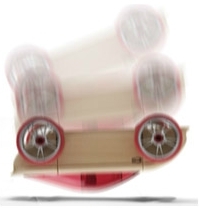 While your Automoblox car is not warrenteed from such abuse, Automoblox just thought it should be able to withstand a crash or two from the second story stair landing. 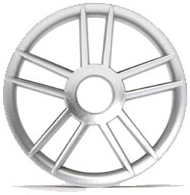 Axels are constructed of polycarbonate plastic as well making them virtually unbreakable. The axels are fixed to the wooden body components with friction so they will stay in place. Each wooden component of the Automoblox play system has three coats of non-toxic laquer applied to the smooth wood finish. Between each application of clear coat the surface is sanded smooth. This durable finish will resist scratches and dent from hours of hard play. 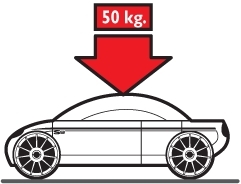 All Automoblox cars can withstand 50kg of downward force. Automoblox recognize that children do some crazy things when mom and dad are not looking. Automoblox just doesn’t want them to miss any playtime with Automoblox. Automoblox meets or exceeds all the requirements of the voluntary United States safety guidlines ASTM F963a and complies with all of the standards of the European Union’s EN-71. Quality, safety and durability are vitally important to the essence of Automoblox. Component that had the possiblity of breakage under extreme play conditions were upgraded to keep the play experience as safe and rewarding as possible. 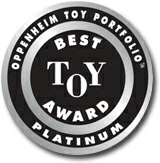 Co-founded in 1989 by child development experts Joanne and Stephanie Oppenheim, the Oppenheim Toy Portfolio Platinum Awards are given to the most outstanding and innovative new products that enhance the play lives of children. The Practical Preschool awards aims to highlight those companies that have introduced innovative, educational resources into the market place. 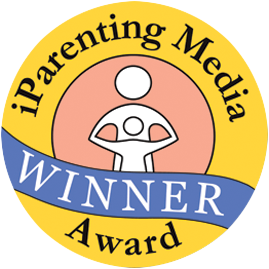 iParenting Media is the premier media company focused on parents with an award program that provides a credible and objective method of determining the best products in the children’s media and juvenile products industry, and recognizes those products with awards. Established in 2006 by seasoned journalist, David Smith. Having rediscovered his love of toys following the arrival of his two boys, ToyTalk allows David to combine his three passions in life – his family, writing and having fun. 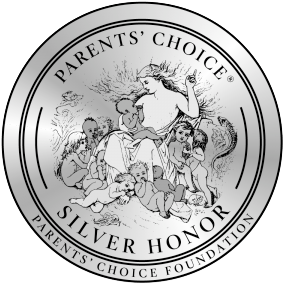 Established in 1978, Parents’ Choice Foundation is the nation’s oldest not-forprofit evaluator of children’s books, videos, toys, audios, computer software, television, and magazines.